Since he turned against the Iraq War that he once championed, Andrew Sullivan has taken to using the term “neocon” as a curse word. “The neocon hope that Ahmadinejad keeps himself in power – barely disguised any more – seems to me premature,” Sullivan said a few days ago — while linking to a blog post that is more accurately summarized by its own headline: “The Bright Side of Ahmadinejad’s ‘Win'”. Now, there is something you need to know. I am a neocon. Given all that has happened over the past ten years, I am sure my PR consultant would advise me to drop this label. But I don’t employ a PR consultant. [KP note: please contact me if you’d like to discuss your PR needs.] So, stubbornly, I cling on to the designation. It declares my belief in two things – that in every country in the world, wherever it may be and whatever its traditions, the people yearn for liberty, for free expression and for democracy; and that the spread of liberty and democracy (not necessarily through the barrel of a gun) is the only real way to bring peace to the world. I believe that what we are seeing on the streets of Iran now is a vindication of these neoconservative ideas. Hear hear, and I’ll take it a step further: It is a vindication of the decision to overthrow Saddam Hussein and liberate Iraq. I sniped at Sullivan in my first Iran post for saying that Obama inspired the Iranian revolt by sweeping away the Bush years. To me it seems self-evident that exactly the opposite is true. If the Bush Administration had not planted democracies (albeit still troubled democracies) in Iraq and Afghanistan, it’s inconceivable to me that so many Iranians would risk their lives and their freedom for an idealistic vision that did not yet exist in their neighborhood. Just as it was inconceivable that Libya would renounce its nuclear ambitions in the absence of a credible threat. In the long run, the only hope for victory over Islamic fascism is a Reformation within Islam. As Jews and Christians have evolved beyond the most repugnant parts of their own scriptures, so too can Islam. If an Islamic Reformation occurs, the democracies that President Bush helped install in the heart of the ancient Caliphate will play an important role. And yes, I’m a neocon too. This entry was posted in Uncategorized and tagged Andrew Sullivan, Bush, Conservatism, Iran, Islam, Islamic Fascism, Obama by Kirk Petersen. Bookmark the permalink. In the long historical perspective, perhaps Moussavi will be known as the “Henry VIII” of Islam, the sparkplug of reform. The Herman’s Hermits of the 22nd century will immortalize him in a pop classic. This is interesting. It’s hard to say but I hope you’re right. What attracted me to the idea of neoconservatism is that liberty should be defended without question. Neocons have been so much better on this point than almost everyone, but I would have to agree with Michael Totten’s criticisms. I can say that I definitely agree with this. I’m partial to neoconservatism, but I’m not a conservative. If I’m not, and never was, then I can’t be a “neo” one. Robert, Totten was “parting ways” with something Irving Kristol wrote. Kristol may be upset about our culture “sinking to new lows in vulgarity,” but that certainly isn’t what he or neoconservatism are known for. I’ll take “libertarian” as a label, too — that’s where an online quiz placed me. And I’m a liberal on social issues. I agree that the people of Iran are proof that there are people of all cultures yearning for liberty. So where the people who danced in downtown Baghdad and slapped the face of Saddam Hussein’s fallen statue with their shoes. So were the people who protested in Tiananmen Square twenty years ago. I don’t see many in the media giving neconservatives or the Iraq War any credit though. I think you’re onto something. Since every candidate is screened and selected by the Mullahs, Moussavi would be only a baby step. But even though Tehran wouldn’t turn into an Amsterdam (or even a Salem, Oregon) overnight, he’s still a step in the right direction. By the way, what definition are you using for “neocon”? I’ve seen so many, mostly insults. Etymologically, “neocon” simply means “new conservative,” implying that the person previously was not conservative. And that goes for me too. Aside from neocon, the other label I sometimes hang on myself is “9/11 Republican”, because that was the major turning point. I voted for Gore in 2000 and Bush in 2004. 9/11 Republican – that’s how I’ve described you before. Those definitions are fine by me. I suppose that makes me just a plain old conservative, since I’ve been of the same political bent since I was eight. A Goldwater version, if one must be specific. Right-wing Libertarian would be another, I suppose. Here’s hoping to a new, improved Iranian revolution. Pingback: GayPatriot » Would There Be Green In Iran Without Purple In Iraq? The idea of freedom and fair elections should be held by all Americans. You have obviously never been to Iran because your analysis of it is hopelessly wrong. 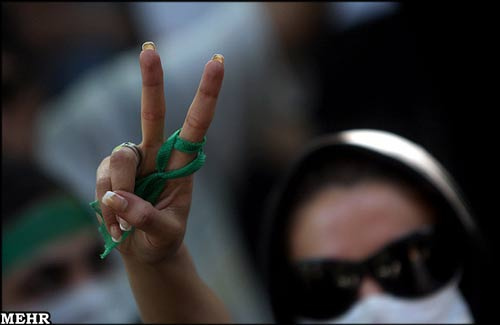 Iraq and Afghanistan have absolutely zero to do with the current protests in Iran. Iranians are upset about internal political and economic conditions, not U.S. actions next door. If you ever bothered to read an Iranian newspaper you would know that. Furthermore, the desire by Iranians to be self-governing predates the U.S. Revolutionary War. I thought neocons liked history. Cyrus, thank you for stopping by. I must confess, I wondered if you really, really were posting from Iran, but two different web traffic applications confirm it. I was surprised to find that I actually have had 20 visitors from Iran, placing Iran 30th among the more than 100 countries that have sent visitors to my humble blog. I and many others will continue praying for the safety and freedom of the people of Iran, and of Iraq and Afghanistan as well. jason, you got one thing right — I’ve never been to Iran. Obviously, internal issues are the primary motivation behind the uprising. But it’s hard to believe that so many Iranians would risk their lives and freedom if they had not been given hope by seeing equally oppressive regimes overthrown to the east and west.